The Champlain Sea was the body of water that once covered Ottawa, and the St. Lawrence Lowlands. It extended down into the Champlain Valley (Vermont), the lower Black River Valley & Tug Hill Plateau (New York), and reached as far west as the Lake Ontario Basin. 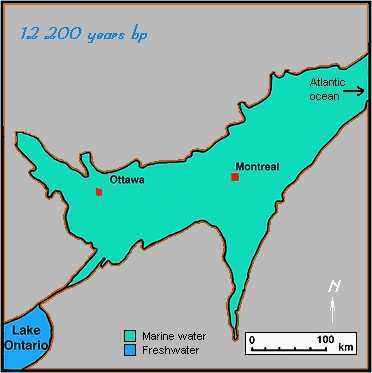 The sea was well established in the mouth of the Gatineau River valley, and Ottawa region by about 12 200 years b.p. This episode was mearly a flash in geologic time, existing for a little more then 2000 years. The Champlain Sea displays beautiful fossil assemblages which perfectly display the effects of the unloading of glacial ice, and the response of organisms to changing environments.